"I've been following and enjoying your podcasts, and you are usually right on the money with your advice and observations," said David Shough. "But I have to disagree with you regarding the Lensbaby lenses. It's an awesome tool... I use it nearly every shoot (studio, product, and weddings). The reason a lockable Lensbaby is so appealing is that is lets you shoot with long exposures, as well as giving you a way to get repeatable studio shots. At less than $300, it's a steal. I'll be getting one soon." Well, David, I'd say you rose to the Lensbaby challenge admirably. 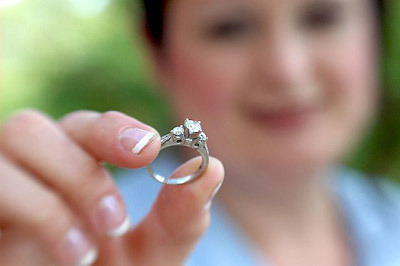 This shot of a bride's ring is quite powerful. And now I can say that I've seen a great shot made with a Lensbaby. Well done! I was going to comment on the previous post that I've seen a lensbaby give a lingerie model cottage cheese thighs, even in the hands of a photographer who specializes in photographing women. But I think David might have proven it can work in the right context. Although this image is quite nice I don't believe the lensbaby is worth it for most photographers unless you plan on talking many shots with this effect like David does or just want to have fun with a new device. For the occasional image you can just use photoshop, gimp, or whatever else you like. I went to the lensbabies website and viewed their gallery of images, to see what kind of shots you can get. I wasn't impressed. I didn't see an image I couldn't easily replicate using Photoshop filters and layermasks. (Duplicate the image do a radial blur and then add a layer mask to blur only what you want.) And with photoshop you can get exactly the look you want everytime. Also did a second version with a more dramatic effect. total time to do this is under a minute. Instructions are in the image descriptions. I'm not saying these are the coolest images ever I'm just saying it's not worth paying $250 to get this effect when you can do it in photoshop in a minute. Unless of coarse your doing this effect on tons of images. I recorded a screencapture movie how to do this, If I have time I'll post the link on flickr in the decription section of the above images.